Welcome to the German to English Translation Online Directory. This page lists German translation courses in the UK run by British universities. The listings are given in alphabetical order, by city, and include undergraduate, graduate and postgraduate qualifications. For courses in other geographical regions, or for courses aimed at preparing students for a recognised professional German to English translation qualification, such as the DipTrans, see the listings here. Have YOU studied at one of the German translation courses listed here? Tell us what you thought of the course. Helpful entries will be rewarded with a link to your website! The Translation & Professional Language Skills programme also offers a 9 month diploma course (the MA course minus a dissertation). During the year students are usually put on placements with the language services of international organisations, government departments or translation companies. One year full time/two years part time. They say the course complies with the guidelines for the European Master’s in Translation (EMT) although it is not listed as a member of the EMT network. Suitable for any source- and target-language pairing. This university is a member of the EUROPEAN MASTER’S IN TRANSLATION (EMT) network. Heriot Watt’s School of Management and Languages at offers a undergraduate and postgraduate course in translation. Undergraduate courses offered by the department of Languages and Intercultural Studies. All the degree programmes include a compulsory third year abroad, at exchange partner institutions in Germany, Austria and Switzerland. Heriot Watt is one of only 4 UK members recognised by CIUTI (International Permanent Conference of University Institutes of Translators and Interpreters). It is also a member of the UK’s Institute of Translation and Interpreting (ITI). The University’s School of Literatures, Languages and Cultures runs a Translation Studies Graduate Programme which it touts as one of the most comprehensive and flexible German translation courses in the UK. The Faculty of Arts and Social Sciences at Hull has a department of modern languages offering undergraduate and postgraduate courses in translation. Their department also pursues research into translation studies. Middlesex offers a 4-year full time undergraduate degree in translation, and a 1-year full time/2-year part time MA, both at their campus in Hendon. German and English is one of their most popular language pairs. The course is included in the EU’s Language and Translation Directorate. If you've taken a German translation course in the UK, or a translation-related subject at any of these institutions - or if you are currently a student - then what did you think of the course? Who would you recommend it to? Our visitors welcome any feedback or comments you may have. 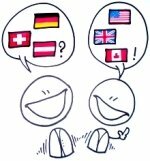 Help other visitors who are currently choosing between the many German translation courses in the UK and tell us what you thought, and see what others have said. Centre for Translation and Intercultural Studies (CTIS) – the largest concentration of translation and interpreting specialists in the UK. All undergraduate students spend a year abroad, either with a work placement or at German-speaking university and the School arranges an optional visit to Brussels each summer for MA students to find out about the work of EU translators and interpreters. The MA in Translation Studies is is a part-time, distance learning course run over a period of 3 years. The MA in Translation and Technical Communication is 1 year full time or 2 years part time. For candidates with an advanced knowledge of German. The Translation Research Summer School (TRSS) is run by 3 British universities and the Hong Kong Baptist University. They offer a 2-week summer school for around 30 participants at one of the 3 British universities, and a 2-week course at Hong Kong Baptist. The courses are intensive and aimed at those considering research in the field of translation and intercultural studies. 3. Translation Studies Graduate Programme, School of Literatures, Languages and Cultures at the University of Edinburgh (www.ed.ac.uk/schools-departments/literatures-languages-cultures/graduate-school/masters-programmes/translation-studies). If you know of any other institutions running similar German translation courses in the UK and they are not on this list, then do let us know. Thank you!